Utilizing over fifteen years of EFI only experience – our talented engineers came-up with this revolutionary manifold which is about to rewrite the chapter of performance. 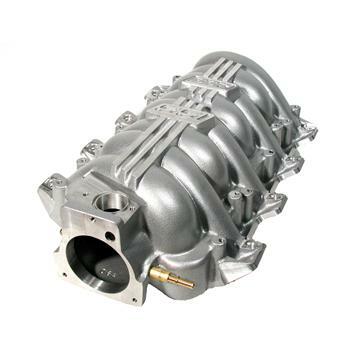 With a lower manifold that features an open runner design for cooler intake air mixture and identical runner shapes for equal distribution and an upper manifold featuring high torque twin plenums for maximum street performance. Topped with beautiful anodized aluminum high-flow fuel rails and a durable metallic-charcoal powdercoat finish – this new SSI Series manifold sends the competition back to the drawing board. Our engineers have done it again with this slick new Race-Series intake manifold. This was accomplished by simply adding our high-flowing equal runner lower manifold with an all new short runner upper along with our high-flow fuel rail kit. And how does it work? Try even more horsepower to the wheels over our base SSI manifold kit while giving up less torque at low RPMs.